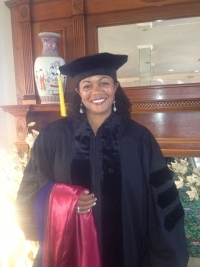 LaVera J. Forbes, PhD, is one of the first two PhD graduates of the School of Mind-Body Medicine at Saybrook University. On May 13, 2013 she passed her dissertation conference, based on her dissertation on: Food Addiction: An Overlooked Cause of Persistent Overweight and Obesity. On July 17, she presented her Saybrook dissertation research at the National Wellness Conference (NWC) in Stevens Point, Wisconsin. The NWC is one of the most prominent North American conferences on wellness, health promotion, and health and wellness coaching. Dr. Forbes spoke on the topic of food addiction and physician weight bias. Her session educated participants on the recent theoretical advancements that explain some aspects of modern obesity, helped them identify the symptoms of food addiction and signs of physician weight bias. She gave participants a variety of new tools and resources for incorporating the concepts into their own lives or wellness programs. Scientific research has shown that overweight and obesity are extremely complex mixtures of biological, neurological, psychological, environmental, and societal factors. In spite of this, there is a pervasive belief that most overweight and obese people choose to overeat and not exercise, making obesity a lifestyle choice. According to Dr. Forbes, food addiction theory suggests that certain foods may trigger an addictive process in the brain similar to alcohol or drug dependence and may help explain why so many people are unable to lose or sustain weight loss. In her dissertation, Dr. Forbes created and conducted physician education programs on the food addiction model, and measured their assumptions about food addiction and their attitudes toward obese patients before and after the educational interventions. Her research showed significant improvements in physician understanding of the food addiction model, and more compassionate and balanced perceptions of obese patients after the intervention.